Center for Whale Research: New calf in J pod: J49! 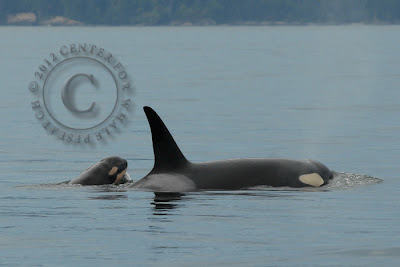 New calf in J pod: J49! J37 has her first calf! Following a nearly two week hiatus in sightings, J pod returned today with what is now a typical “spread out” pattern all along the west side of San Juan Island, heading north. A lone female whale “Spyhopped” in front of CWR at 11:35 am; and, she was subsequently identified as J37 from photographs of her at 11:44am about ¼ mile offshore when she still appeared to be alone (no obvious calf present). We headed out in “Shachi” to update our photo-identification of young whales, and next observed J37 at 2:35pm in Haro Strait off Spieden Channel (48 39’ 42.7”, 123 13’ 50.6”) with a very new born calf! The calf’s dorsal fin was flopped over to the left and there were very visible creases in the blubber of its side due to fetal folding. The head and neck region was lumpy looking, like that of a very newborn human baby, and the calf surfaced with exaggerated head lunges, indicating it had healthy energy and was breathing properly - no maternal lifting required. We followed J37 and her calf at a distance until 3:52pm when they were in Boundary Pass north of Stuart Island; and, all of this time she was not accompanied by any other whales. At that time, part of J pod was ahead of the pair by approximately 2 miles and the other part of J pod was off Lime Kiln Park, having split off from the leaders and gone back south along San Juan Island. By the time the new mother and her calf were nearing Blunden Island, British Columbia, they reportedly joined in the rather loose northern formation of J pod whales still heading northeasterly toward Georgia Strait, and it was reported that the other whales were “supporting” the calf on their backs. Perhaps this support behavior was some kind of greeting ritual for the new baby addition to the population. On previous occasions, we have seen very new calves being supported by and pushed around by other whales in the community, perhaps in some sort of “new whale baby” welcoming and bonding ritual. The immediate family of the new calf – mum, grandma, aunt and uncle – reportedly broke off from the other whales before entering Georgia Strait and heading toward Sucia Island, Rosario Strait by nightfall. A bit of History about the mum: The first catalogue quality photograph we have of J37 as a baby was in August 2001, at which time she appeared to be five or six months old. Then, the first photograph we have of J37 with a baby was today, August 6, 2012, so we can assume that the new mother is 11 ½ years old - the youngest confirmed mother that we are aware of in the Southern Resident Community. With a gestation of approximately 17 months she must have been impregnated during or around January 2011 when she was about 10 years old! We had four encounters with J pod in January 2011 and all were with both J and K pods combined and L87. Hence, the father must have been among them at that time. Maybe this is why L87 is hanging around J pod so much! A little bit about the family: The grandmother of the new calf, J14, is thirty eight years old and is the very productive mother of three living offspring and three that have not made it to the present time. Her first calf, J23 born in 1987, was a male that survived for four years. Her second calf, J30 born in 1995, was a male that survived until December 2011, but went curiously missing all of this year and is presumed dead. J37 is J14’s third calf born in 2001, and J40 (a female) is her fourth calf born in 2004. J14 had a neonate calf (J43) that was seen on one day, 24 November 2007, but it did not survive. Most recently, in March 2009, J14 had another calf, J45 a male, that survives to the present. The new calf of J37 will be designated J49, and it is born into a very productive matriline so we are hoping it fares well. With this birth, the Southern Resident Killer Whale Population (SRKW in government jargon) now numbers 86, though that number could change at any time with births and deaths. Please be respectful of the new baby and its family and keep more than a two hundred yard distance away when viewing from a maneuverable vessel. The professional whale watching operators will no doubt be extra cautious on the whales’ behalf. This is excellent news! Thank you for the post! Congratulations J37! Thank you for the good news!